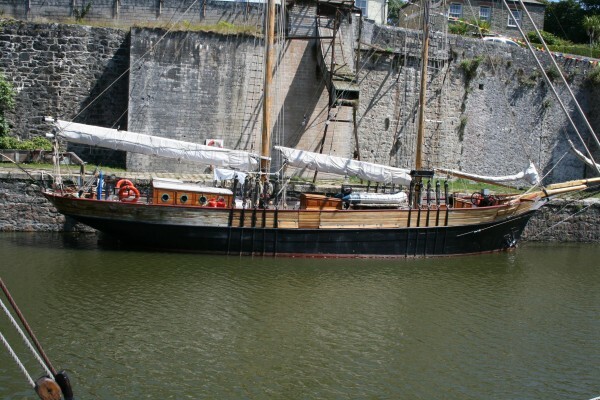 Built as a fishing vessel in 1945 by the Rhoose Shipyard, Belgium, she was laid up as a completed hull immediately after the completion of the build and never used for fishing. 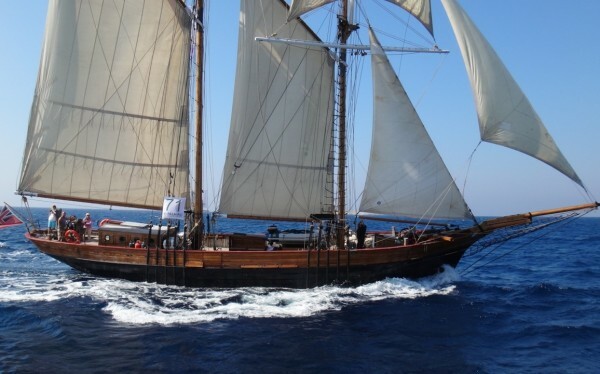 In 1952 she was bought and subsequently converted to a private yacht by a Dutch gentleman and under his guidance gained herself a reputation as a fast and graceful ship. 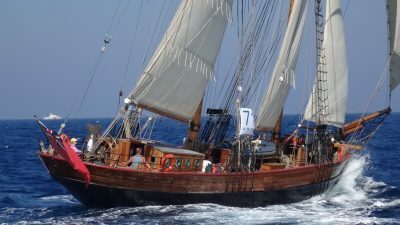 In the late 1980’s she was sold into British ownership and underwent a major refit by T. Nielsen and Co. in Gloucester before going on to be used as a private yacht plus some charter work in the Mediterranean, Caribbean and east coast USA. 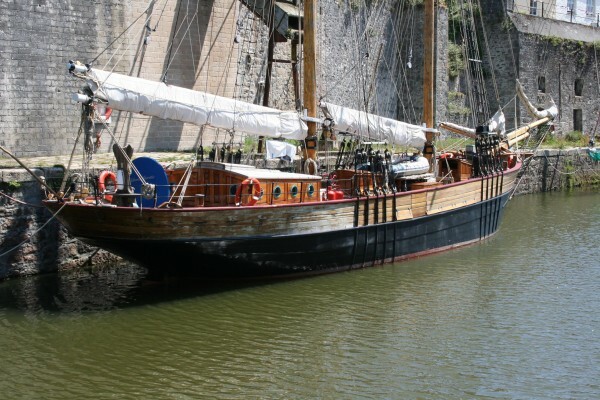 She came into present ownership after a period of neglect at which stage she had another thorough refit which included al new rigging and an overhaul of machinery and systems. 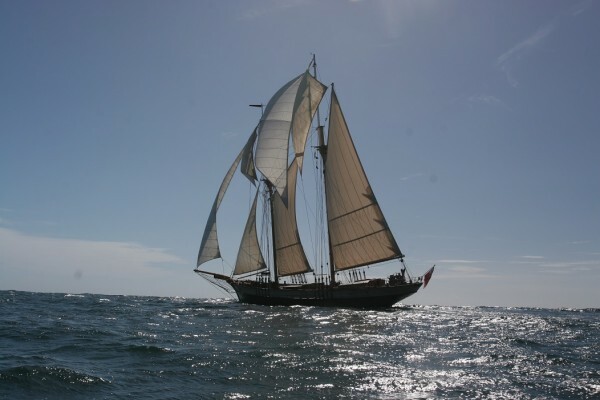 Since then she has been operated as a commercial charter boat and has taken part in several Tall Ships races, winning overall on two separate years. This fine ship has gained herself a reputation as a fast elegant yacht and will always stand out in the crowd. 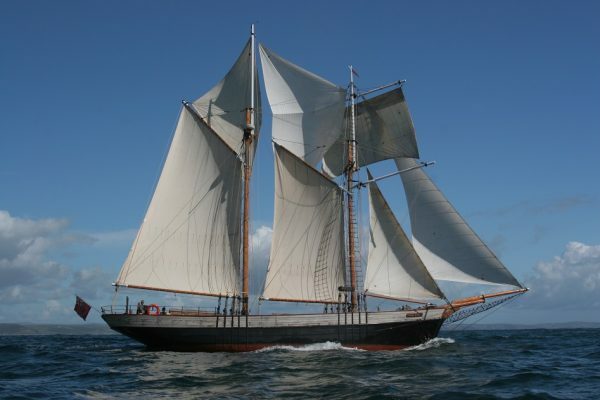 Because of her size and rig plan she is also very manageable and has been sailed by two people on many occasions in the present ownership, however she can easily accommodate a larger crew and guests with a total of 16 berths and plenty of space above and below decks. 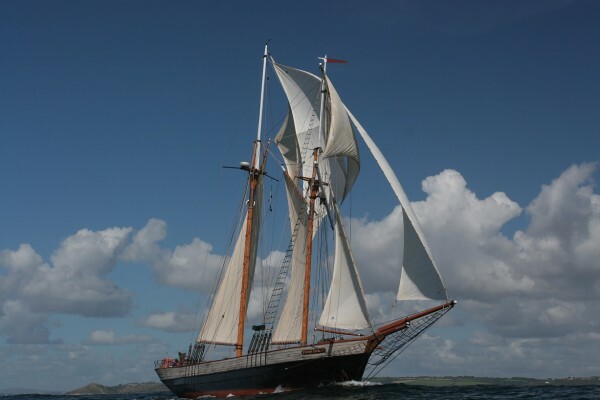 She is currently in very sound condition and fully equipped for commercial charter work. She has an MCA Code of Practice Category 2 certificate and has in the past been coded to Cat 0 for ocean sailing. This level of certification could easily be achieved once again by simply upgrading the equipment on board. Planked in 3″ oak all galvanise nail fastened to heavy sawn oak frames. Inspected thoroughly in present and past ownership due to regulations of the commercial licence. One plank replaced in 2008 otherwise the hull appears to be in very sound condition. She has two water tight bulkheads making 3 separate compartments in the ship. Straight laid 2.5″ Iroko deck fastened with galvanise dumps, caulked in the traditional way and payed with pitch. 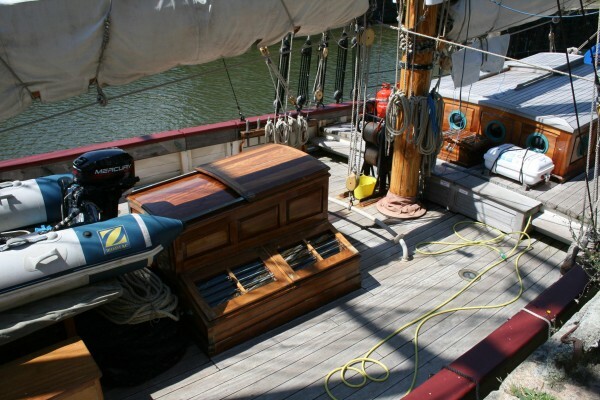 This deck was laid during the 91′ refit. She has a step in the deck at the aft to increase headroom in the aft cabin. High bulwarks on oak stanchions mounted through the coverboards. Pin rails for the running rigging are fixed to the inside of the bulwarks. 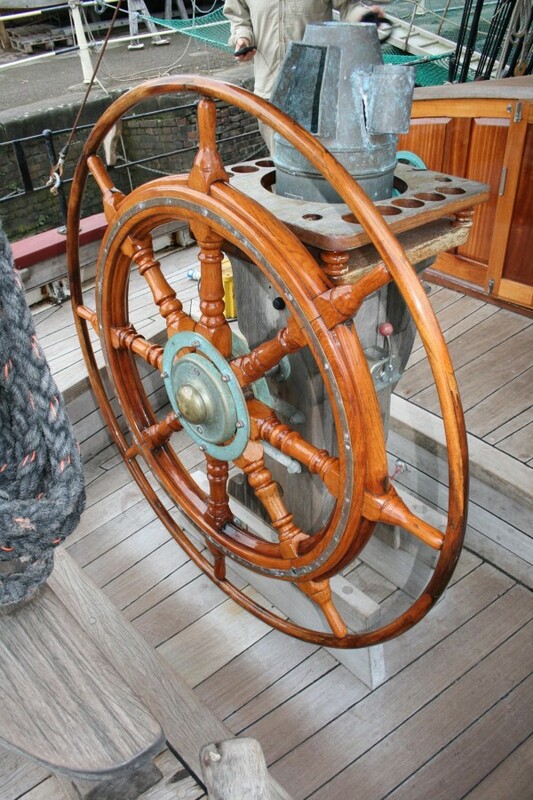 There is a well in the aft deck for the helmsman with the large varnished wheel mounted on a pedestal in this well. When standing at deck level the helmsman has good visibility over the bow, however he can also sit on the deck with feet in the well which is a safe and comfortable position for long night watches. 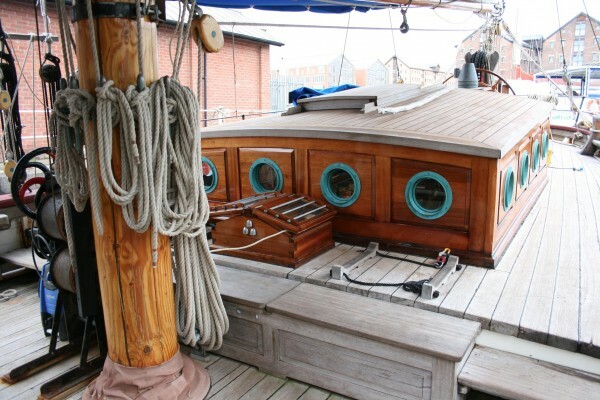 Deck structures are all varnished teak and date from the 91′ refit. 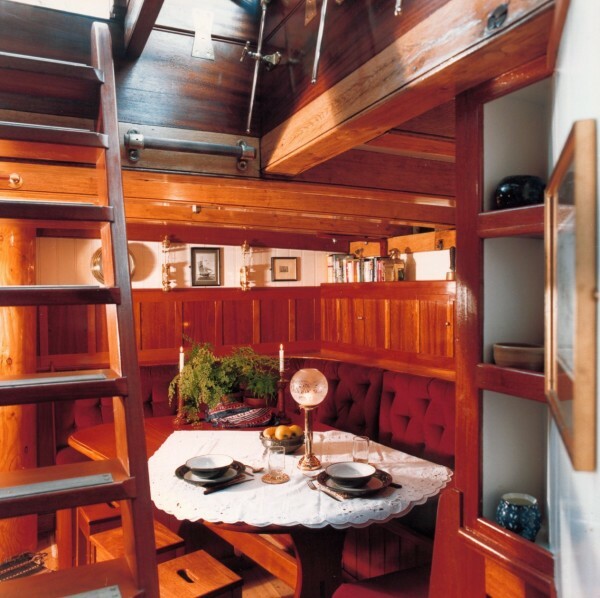 Large doghouse over the aft cabin with its own companionway. Laid teak doghouse deck and bronze portholes. 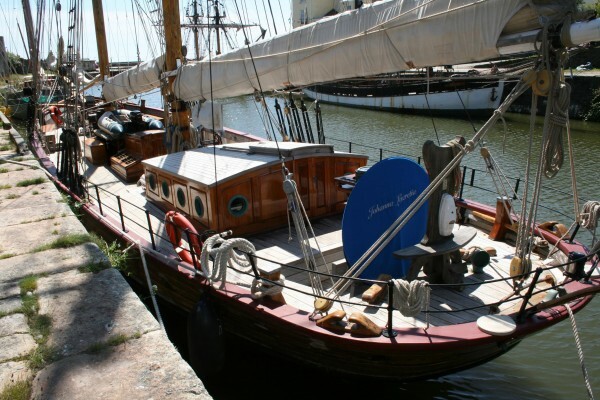 The main entrance hatch is just forward of the main mast and is a wide and easy companionway into the boat. Forward of this is a butterfly skylight with a heavy permanently mounted varnished teak table over it. 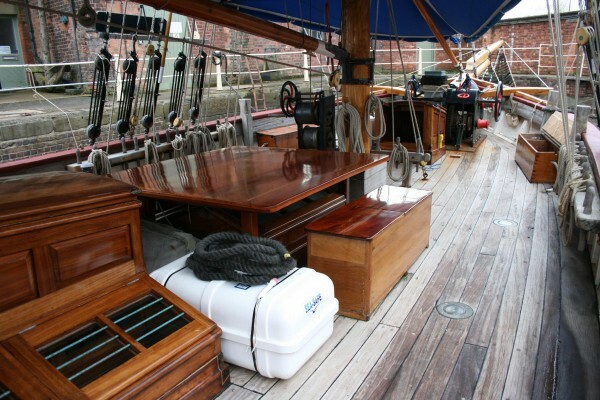 The table serves as table for alfresco dining but also as a safe and stable platform for packing the fore mainsail. Storage boxes mounted to the deck serve as seats to the table. Forehatch on the centreline in front of the fore mast gives access to the forward cabin, usually the crew accommodation. 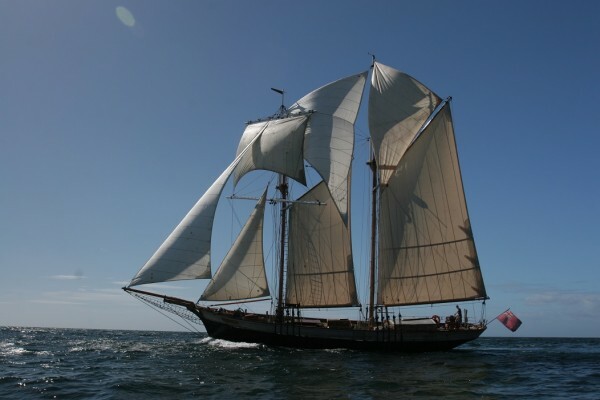 Topsail schooner rig on solid keel stepped pine masts. 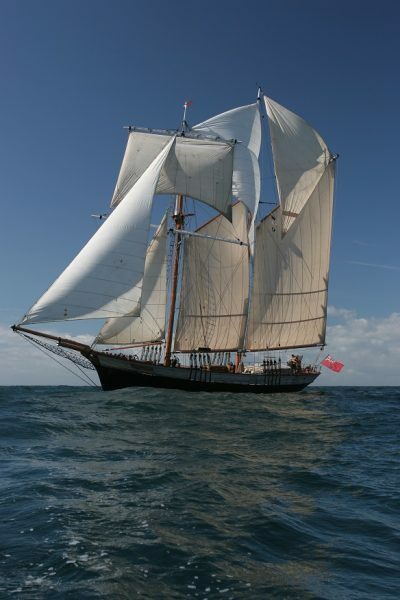 This is a rig design that offers a huge amount of flexibility with its fore and aft sails as well as square sails meaning she can be sailed comfortable on any point of sail. The whole rig was removed in 2008, the spars stripped and all standing and running rigging replaced as well as all new varnish and paint work. Standing rigging is galvanised wire, parcelled and served in the traditional way and coated with black varnish. Dead eyes and lanyards to external galvanised chain plates. Ratlines for both masts to access the tops. 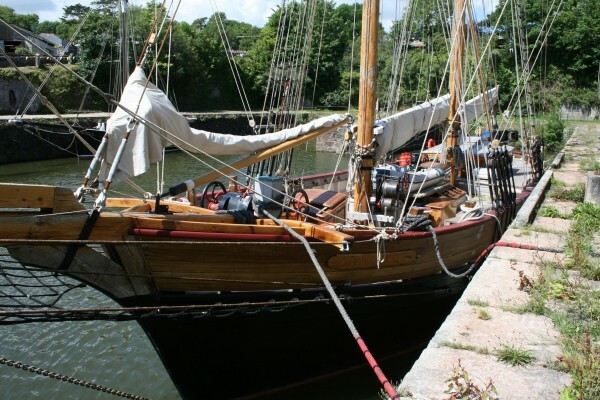 Square sail yards are hollow aluminium tubes which help to cut down the weight. All lines to control the square topsail run to the deck so the topsail and the main coarse can be set from deck without the need for any crew to go aloft. Total sail area of 4027sqft (374sqm). Ford New Holland 40 Series 6 cyl 160hp normally aspirated diesel installed new in 1992. New stainless steel shaft to a fixed 3 blade bronze propellor with single lever controls. Fischer Panda 9.2kva 240v generator. All electrical control and charging systems replaced in 2014 with Victron battery chargers and large inverters. All tanks are stainless steel. 16 berths in 6 sleeping cabins including the crew accommodation. The main sleeping cabins are in the centre of the ship with 2 double cabins, a twin and to starboard is a cabin with 4 single berths. Up forward is a crew cabin with 4 singles and a large amount of storage space. 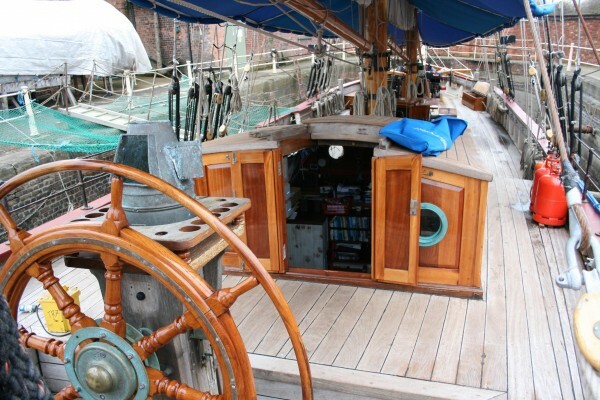 Back aft is a double for the skipper in the large aft cabin. 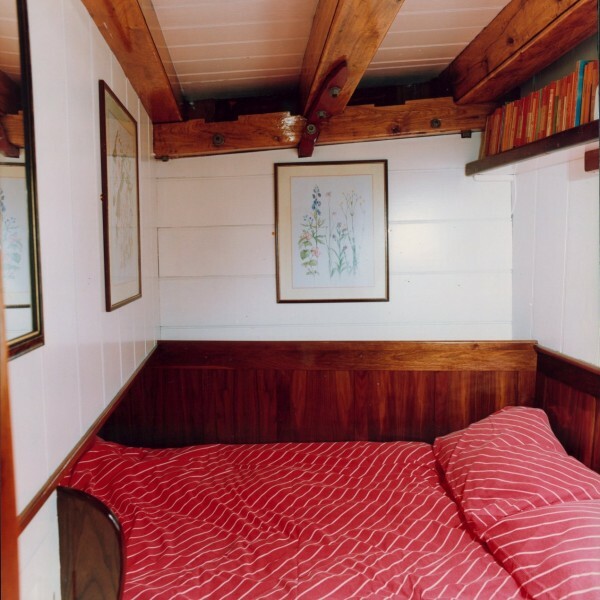 This area has been used for storage and as an owners/skippers cabin in present ownership, however there is scope to alter it to give more accommodation if necessary. 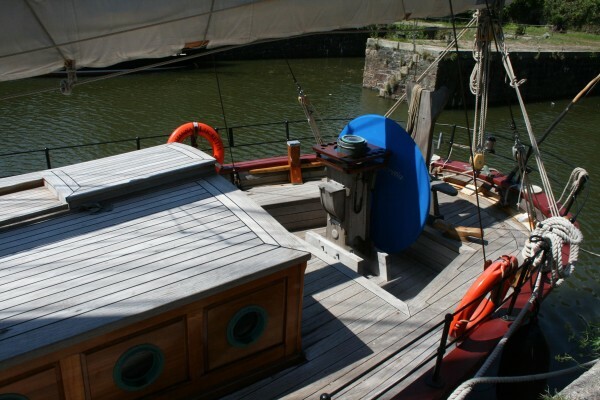 Access from stem to stern below decks. 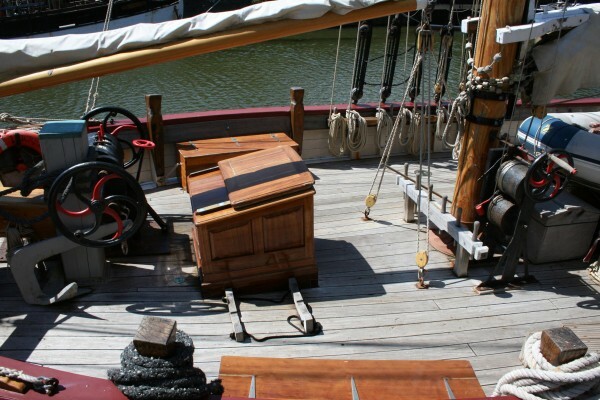 Saloon is in the centre of the ship to port with the galley over to starboard. 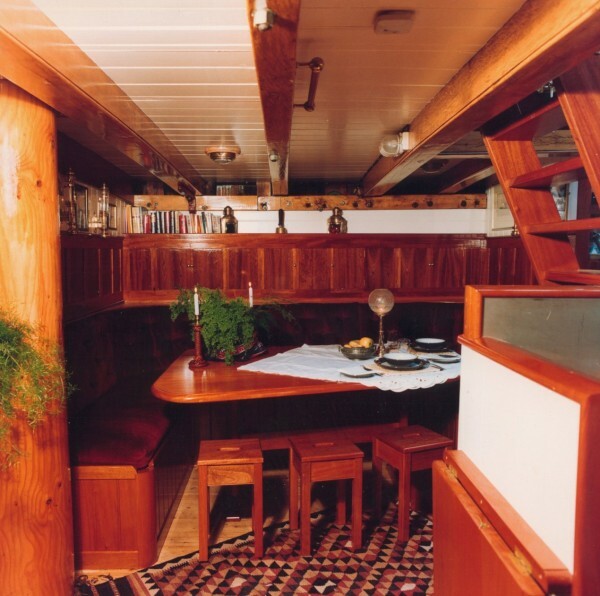 Large saloon table with ample seating for the ships crew. Much of the joinery here dates from the 91′ refit and is all to a very high standard with panelled hardwoods. Large U shape galley with a 4 burner gas stove with a large oven and an ample sized fridge. Plenty of work surface and storage in bulkhead mounted lockers and cupboards below the work surface. Two heads compartments in the centre of the ship. 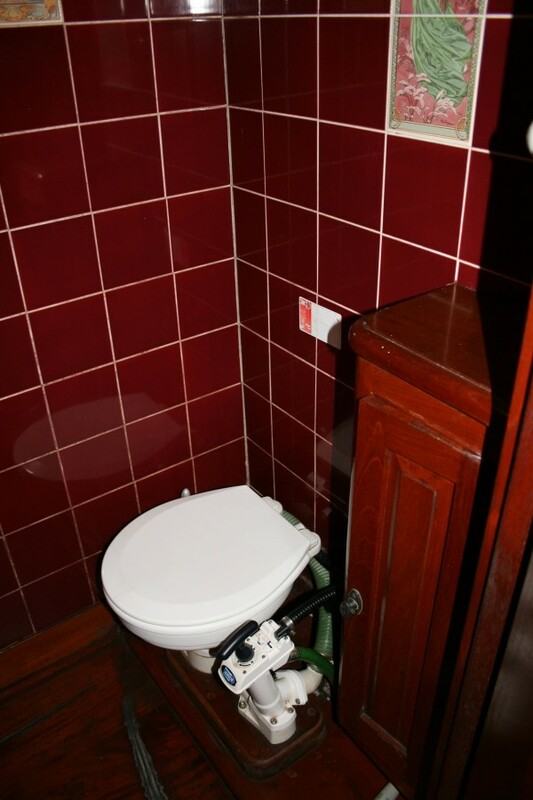 Both are a wet room style with a Jabsco sea toilet, hand basin and shower.